Here we are, deep into autumn and the wheels have been rolling here at the mission. We have been to Fort McDermitt, NV; Celilo Village, OR; White Swan, WA (a couple of times); St. Ignatius, MT; and the Pine Ridge Reservation in South Dakota. Whew! It’s been a busy summer, but we’re praising God for the supplies we had to give out and the fuel to get it there. We could not have done it but for the faithful support of our teammates. Thank you from the depth of my old heart! Matthew 5:7 says, “Blessed are the merciful: for they shall obtain mercy”. It’s not right that people who refuse to help the poor should have their own needs relieved. God will deal with us the way we deal with others, so you can praise the Lord, Teammate, because you have helped the poor indeed! 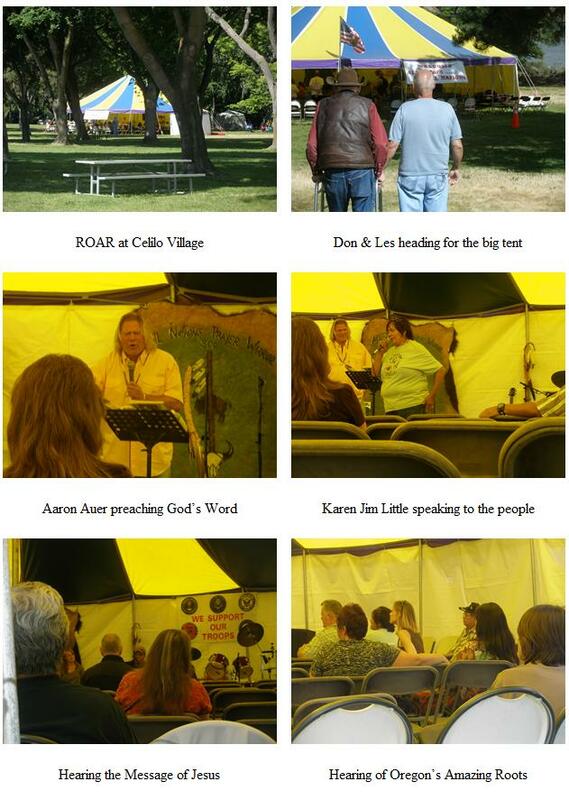 Les and I joined Aaron Auer’s ROAR camp meeting at Celilo Village this summer. You can see a clip of the old preacher on your computer at www.ROAR.org. 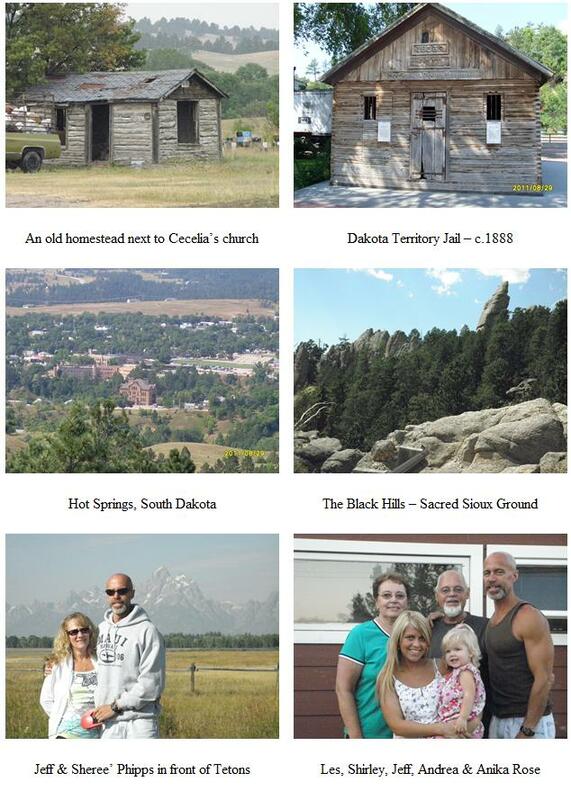 Then, our big trip was to South Dakota. Les, his wife Shirley, their son, Jeff and his new bride, Sheree’ went to leave food, furniture, clothing and household goods for Cecelia Spotted Bear, Cindy Antelope, and Kate Kindle to pass out in their areas. We also left backpacks loaded with school supplies to be given to the kids. Neighbor, you would have thought it was Christmas the way the kids’ eyes lit up! What a treat for them; usually they don’t have supplies at all or not enough for school. Then, Bob King and Jeff Phipps made a trip to St. Ignatius to drop off food, clothing, household goods and MATTRESSES! These are the mattresses from Bedco, Inc. that we’ve been talking about on the radio, and they went like hotcakes. As soon as we were home, Bernie called and said she needed more. What a privilege to help these dear people in the name of the Lord and what a blessing to have teammates like you who make it all possible! As I’ve said before, we couldn’t do it without you and I want to thank you for all that you’ve done. Thank you, too, for helping with our Christmas shoebox project; I pray God’s richest blessings on you and your family. Les and Shirley Phipps, their son, Jeff and his wife, Sheree’, headed out this summer for the Mid-West fully loaded. 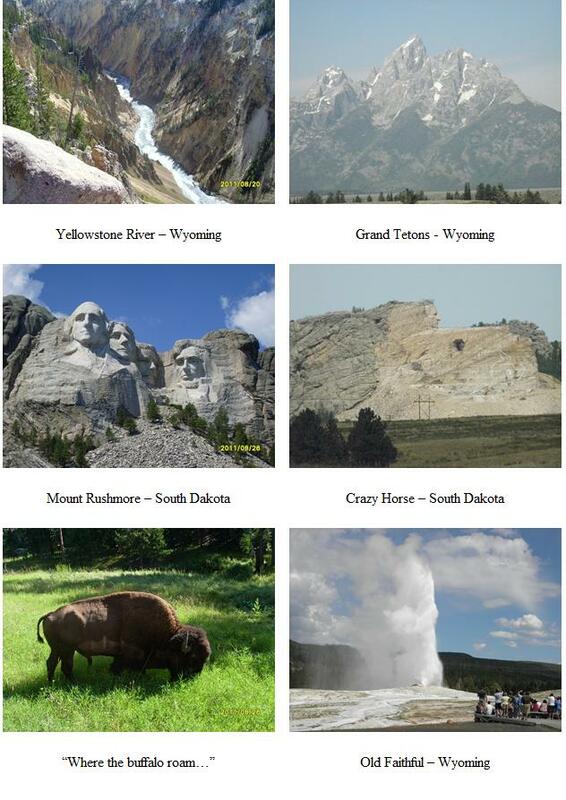 They passed through Wyoming where there are some beautiful sights to see. How blessed we are to live in this country, not only because of its beauty, but because, even with all its faults, it’s still the best place on earth to live! Then, on to South Dakota where they ministered to our point people, Kate, Cindy, Cecelia, and Alex. 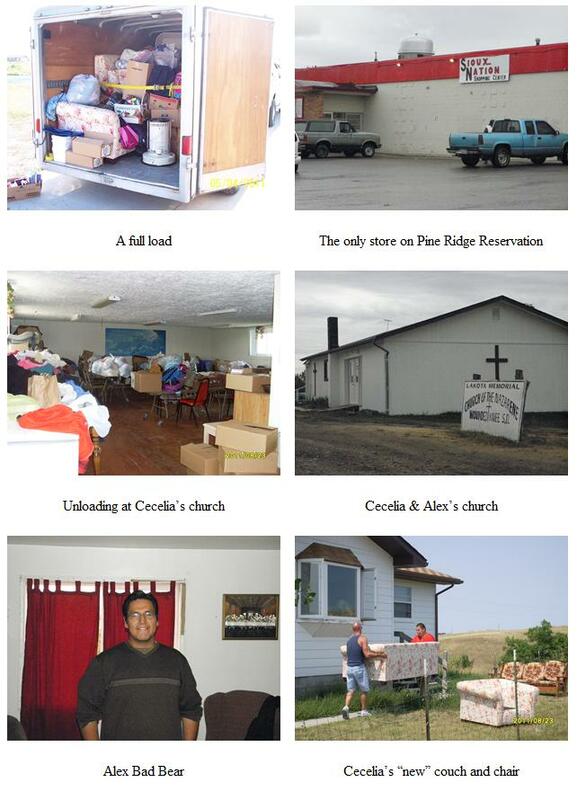 What a privilege to supply goods that are needed out on the reservation to these “missionaries to their own people”. How wonderful for them to be able to supply food, clothing, furniture, and household goods while telling their neighbors of “Jesus and His love”. They dropped off a lot of nice things at the church where Cecelia and Alex minister. Cecelia received a “new to her” couch and easy chair. They will go into different rooms, as her house is small, but she is delighted to have an “extra bed” now! How gratifying to be able to bring some cheer to God’s faithful servant. Then, at Kate’s they left off more goods and got a peek at the star quilt she’s making. Star quilts are a specialty of Native women and a prized gift if you’re ever blessed to receive one. At Cindy’s, the crew met the grandchildren that Cindy is caring for: 3 sweet little girls and 1 grandson who is still in diapers. We spoke on the radio of this little boy, Malachi. Cindy was out of diapers and trusting the Lord to somehow supply the need. It costs Cindy $30.00 to get a ride to shop in Rapid City since she doesn’t have a car. (the only store on the Rez has high prices like the little store on your corner). Please pray that her needs for both diapers and a vehicle are met. Cindy has the faith of a child, just like the scriptures teach we ALL should have. She has health problems of her own, but is glad to take care of her grandkids out of love and a desire to teach them of Jesus. I have never heard her complain, but only talk of “praying about the problem”. Her health clinic is 15 miles away, her daughter’s school is 18 miles away (she walks most of the time), and the shopping center in Rapid City is about 100 miles away. In the summer the temperature is often 100 degrees or more and in winter it can reach below zero WITH a wind chill factor making it feel even colder. They live in a harsh part of the country, but Cindy is cheerful anyway. She told me she was out of propane for her house when a call came from Cecelia Spotted Bear saying she had ordered some for Cindy. Praise God for the “family of God”; we can care for one another. “Beloved, if God so loved us, we also ought to love one another.” I John 4:11. Les, Jeff, and their wives were then able to spend time with granddaughter/daughter, Andrea, and great granddaughter/granddaughter, Anika Rose and other family before heading home to Portland. Below you can see the 4 generations. Bob King and Jeff Phipps took a full load of toys, food, Christmas gifts, appliances, clothes, furniture, and mattresses to St. Ignatius, MT this fall. Bernadine Lovell, our “point person”, was ready with a crew to unload into the beautiful Tuff Shed that was donated by Bridal Veil Community Church. We took 12 mattresses that were gone by the time Bob and Jeff left! Neighbors and friends and their children helped and they were all so excited to see the donations. One lady’s dryer had just quit that week and here we brought one; it was an answer to prayer for her. 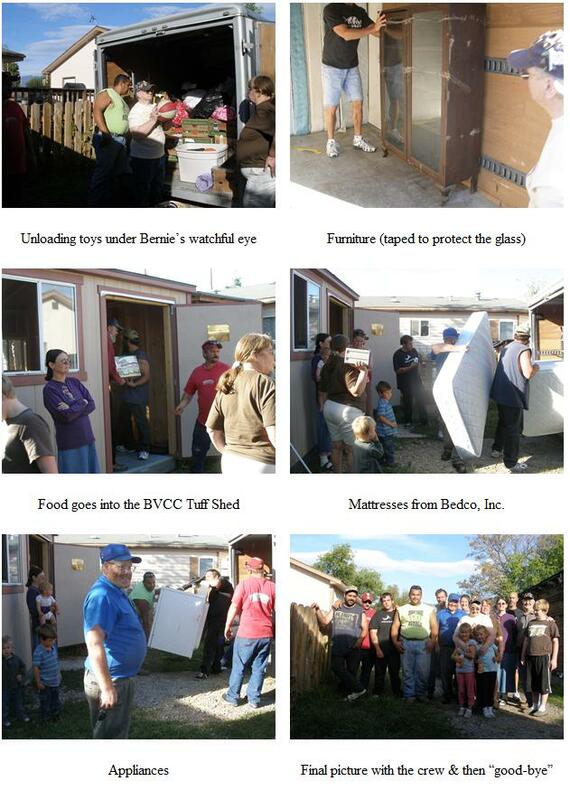 How wonderful the way God put the pieces together with the shed for Bernie and the supplies for First Nation Ministries to take to her. We serve an awesome God! On a hot day in July, Don Cline and Les Phipps drove up the beautiful Columbia River Gorge to Celilo Village to attend a camp meeting put on by Aaron Auer of ROAR (Reviving Oregon’s Amazing Roots). Aaron feels called, not only to preach the Gospel, but to tell Oregonians of the amazing Christian history of this state. Founded by many missionaries, or circuit riding preachers, as they were known, we have a history that most people don’t know of and one that we’ve certainly moved away from. Aaron’s desire is that we move back to our beginning faith and to tell people the way of salvation. We pray God’s blessing on his efforts! The ripple quickly disappeared, the lake was still once more. Will there remain some earthly sign that I have passed before? Have I so lived that other men, who follow in my train, will find the way to Heaven’s shore, or have I lived in vain?